US$ 1130 / person ? 1 Arrival, drive to Thimphu Arrival by plane to Paro airport and drive to Thimphu or in case of arrival by land, crossing border from India in Phuntsholing/Jaigon and full day drive to Thimphu. Stop at Tachog lhakhang to see traditional bridge made using ancient iron chains. See Memorial Chorten, always busy with devotees. Other sightseeing depending on the arrival time. 3 Thimphu – Gangtey (Phobjikha) Transfer to Wangdue Phrodang over Dochu-la pass (3010 m) with visit of royal temple Druk Wangyel lhakhang. In clear weather you have good chances for panoramic views of mountains, including Gangkhar Phuensum (7570m), the highest mountain of Bhutan. Descend to tropical valley of Punatsang chu river. Soon after lunch you will start driving up to the mountains again until you reach pristine Phobjika valley (2750 m). Optionally you can attend lesson on Buddhism led by accomplished master with translation to English in Gangtey monastery shedra (buddhist college). You might also like to try the hot stone bath, traditional Bhutanese treat. 4 Gangtey (Phobjikha) – Wangdue Visit of historical Gangtey gompa. 2½ hour walking tour through the valley is one of the most beautiful and easy hikes in Bhutan. You will go through the buckwheat and potato fields to the mixed forest with trees decorated with old men's beard lichen and finally you will get a view of marshland. Here, in late autumn and winter, rare black neck crane can be seen. Finish hike with the lunch in local farmhouse to taste local kitchen and other delicacies like the salty suja tea and ara spirit. Drive back to Wangdue. If you’re early, you can visit rustic Rinchengang village. 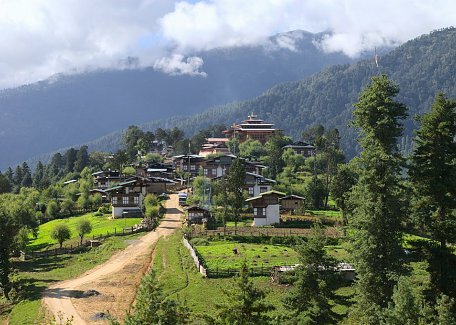 5 Wangdue – Paro Early morning short hike to Khamsum Yulley Namgyal Chorten with wonderful view of the valley and it‘s terraced paddy fields. See the longest suspension bridge in Bhutan stretching the length of 350m over Pho Chhu river. Visit of Punakha dzong, which counts as the most intricately decorated castle in the kingdom. Short walk to Chhimmy lhakhang temple, devoted to 15th century saint Drukpa Kunley, know as “Divine madman”, who did taught Buddhism by singing, drinking and rampant sexual behavior. If time permits, also visit Sangchhen Dorji Lhuendrup Lhakhang nunnery with Bhutanese and Nepali style stupa, overlooking the valley from the high hill. Evening drive to Paro. 6 Paro Visit of the National Museum and Paro dzong (Rinpung dzong), the castle-monastery where Bernardo Bertolucci’s Little Buddha film was shot. Pristine Kyichu lhakhang is one of the two oldest temples built in Bhutan. Climb to Taktsang gomba (Tiger’s Nest) is the highlight of the tour. While the hike seems to be hard, it’s very rewarding. If you don’t feel so strong, you can climb just halfway to cafeteria with nice view of the place. 7 Departure If time permits, you can make visit to Drukyel dzong, the castle ruins from where you can see the summit of holy Jomolhari mountain in clear weather. After that you depart from Paro by flight or take 6 hours drive to land border in Phuntsholing. Jomolhari Yaksa or Druk Path trek (+6 to 7 days): This tour can be quiet nicely extended by moderate high altitude treks, making this tour even more exciting. See the detailed itinerary for Jomolhari combination. Haa valley homestay (+1 nights): At the end of the tour, you can drive over the Chele-la pass (nearly four thousands meter high) to rarely visited Haa valley. On the way you can do hike to Kila gompa, oldest nunnery in Bhutan from 14th century and also experience high altitude on the ridge of the pass from where Mt. Jomolhari and Kanchenjunga can be seen in clear weather. In Haa you'll stay in three hundred years old farmhouse as a guest of local family. Haa is less visited valley due to the fact, it's home to Indian military base. Anyway the nature is very pristine and so are the villages. You can visit few local temples and also make nice village hike around. Tshechu festival (+1 night): With proper planning, we can arrange that you will experience annual tsechu festival in some of the castles or monasteries. There are many festivals in Bhutan, so we can definitely fix your travel dates to match. We just need to start planning well ahead (optimally more then 6 months before) in order to secure flight tickets and hotel reservations. Gasa Hot springs (+1 or 2 days): Gasa is highland region north of Punakha, just recently connected by road. Apart from beautiful dzong and vistas of nearby high peaks, you can enjoy the natural hot springs, so called "tsachu". There is number of pools with different temperatures. Water is sulfurous and it's believed it's beneficial for number of skin ailments. It's great relax in luxurious pools anyway. Additional experience can be spending overnight here in local farmhouse to try authentic Bhutanese hospitality. Bhután je nádherná země, panenská příroda, svébytná kultura, milí lidé. Bylo zde o nás postaráno na vysoké profesionální úrovni. Je vidět, že všichni ve Firefox mají svou práci rádi a svých klientů si nesmírně váží.